This lovely 2 bed cottage is set in a hamlet of about 15 houses. It has a pretty sunny courtyard to the front, with garden table and chairs and a lawned garden behind leading down to a stream with rural views, across fields with access to the nearby lake. On the ground floor there is a fresh white kitchen containing dishwasher, fridge, freezer and microwave. There are double glass doors leading onto the courtyard, ideal for sunny breakfasts. The lounge dining room with a lovely old stone fireplace also has glazed doors to the courtyard. There is a DVD player, a selection of DVDs, books and games and free internet connection. There is a utility room, a WC, and a shower room which also houses the washing machine and tumble drier. Upstairs the newly renovated cottage has 2 bedrooms: a large double bedroom with grey painted furniture and a huge ensuite bathroom and the blue room, a generous twin room, overlooking the garden and stream, also with a good sized ensuite bathroom. All in all this pretty cottage has been very recently redecorated and renovated in a light and airy style then furnished with a collection of vintage French furnishings, fabrics and pictures. The rear garden is on 3 levels, with a drop between them, and the lower lawn has direct access to the shallow slow moving river, so young children will need supervising at all times. The hamlet is quiet and picturesque, and only 3 minutes drive away you will find a choice of 3 villages, 2 with bars and boulangerie, and the third with butchers, bakers, chemist, doctor, dentist, newspaper and tobaconist, restaurant and more! The town of Riberac is about 12 miles away with all shops, several supermarkets and a great Friday market, not to be missed. Bergerac airport is just over an hour away, and Limoges and Bordeaux airports are both about 1 hour 40 mins. The cities of Periguex and Angouleme offer lots of interest, both historic and retail, both about 40 minutes drive and there are pretty historic villages, country walks, canoeing, riding and public swimming pools within easy reach. An ideal spot for a restful holiday, yet with a good choice of pursuits close by. 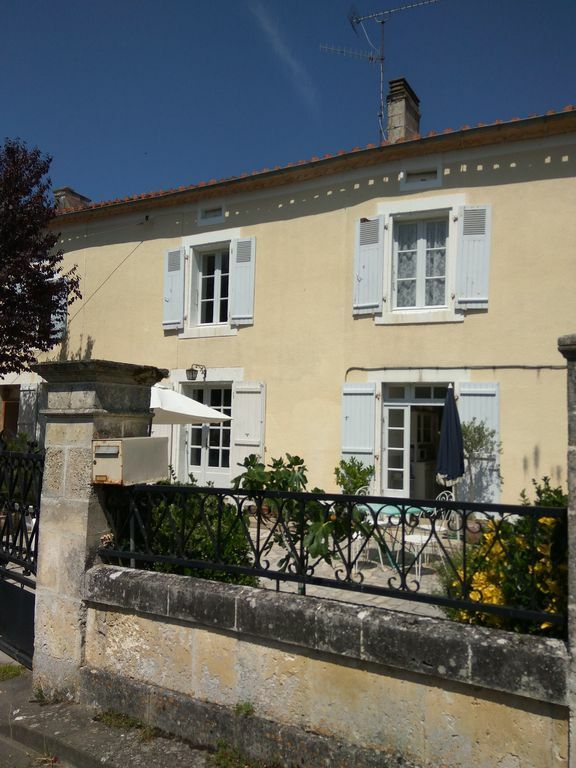 I have lived in France for 13 years, and have just bought and renovated this pair of cottages. I live next door to Le Cerisier and although often out at work, am happy to stop and chat as much or as little as you would like! As well as looking after both cottages, I also have an online business selling French antiques and vintage items, some of which have found their way into the cottage, lending it a little of its old fashion charm. I love this part of rural France. The countryside is beautiful and the pace of life is slow, yet civilisation is not too far away, and there are lots of interesting villages and towns within easy reach. toilet, shower, bidet, Toilet seperate. The sitting room has a comfy 3 piece suit, coffee table, bookcase with english and French books, games and tourist information leaflets. There is a DVD player with a selaction of DVDs and CDs. gas hob, one electric ring. Salt, pepper, cooking oil tea, coffee, suger provided in small quantities, some hebs in the garden. The DVD playeer can also play CDs. Scrabble, Monopoly, other games packs of cards provided. Rear garden, good size, access to pretty river with water lilies, rushes, etc. No fences between the garden and river, so care must be taken and children must be supervised. Outdoor table and chairs and sun loungers for 4 people. Comfortable, spacious, well appointed country cottage in the heart of the Dordogne. We enjoyed our two weeks at Le Cerisier very much , especially the delightful, peaceful village ambience with an old mill stream and nearby lake. Morning walks were amazing , along the many country lanes and byeways. The Bird life and diverse wildflowers of June made my vacation for me. Having a car is essential as the nearest villages and towns for shopping are not close by. For example Vertillac is a 15 minute drive , and Riberac town is 30 minutes for the nearest large supermarket. Our cottage was very comfortable and well appointed but could be improved with a few extra amenities , such as Satellite T.V. , a more modern washing machine and better access to the rear garden area. Thanks, it was a pleasure to meet you both. Regarding distance to shops, it only takes me 5 minutes to drive to nearby Verteillac and 20 max to Riberac, so yes, you do need a car, but we aren't too isolated! Lovely house with beautiful river views to the rear. Very well equipped with everything you need. Simply lovely. Thank you so much! I hope to see you again. Merci! C'était un plaisir de vous rencontrer avec votre famille. Thank you so much for your review, it was lovely to meet you and your family. nous avons passer un très bon séjour. Le cadre est très bien et le logement aussi! Le Cerisier cottage is situated away from the more crowded tourist areas of the Dordogne, yet within easy reach of caves, historic towns, river beaches and a leasure lake. The cities of Angouleme and Perigueux also offer lots of lovely French shops, museums, (including an excellent Roman villa) and many lively bars and cafés. The house contains leaflets and information on many local attractions and I am always very happy to offer further suggestions and advise.